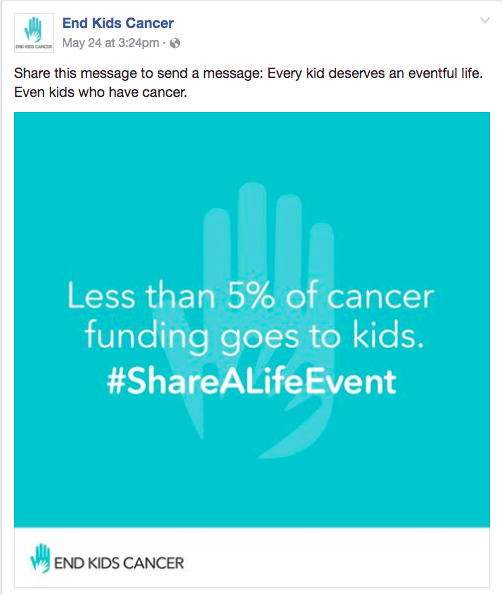 ENDKIDSCANCER: "Share a Life Event"
Billions of dollars are raised to support cancer research every year, but less than 5 percent of that money goes to pediatric cancer. Even though children are highly responsive to treatment, and even though treatments for pediatric cancer are also shown to benefit adult cancer patients, kids are, in many ways, the forgotten victims when it comes to cancer research and fundraising. RPA set out to change that by making a big impact with a tiny budget for a true underdog client: the End Kids Cancer Foundation, whose mission is right in its very name. Our challenge was to do more than raise money in a single campaign; we set out to truly change the narrative about what people think of when they think of cancer patients. To make kids with cancer relatable, we needed to personalize their experiences for adults who could never understand what it’s like to be barely school-aged and facing grim mortality prospects. Rather than asking people to imagine a child’s life, we invited them to think back on their own lives with a shareable campaign that leveraged a unique Facebook feature: Life Events. 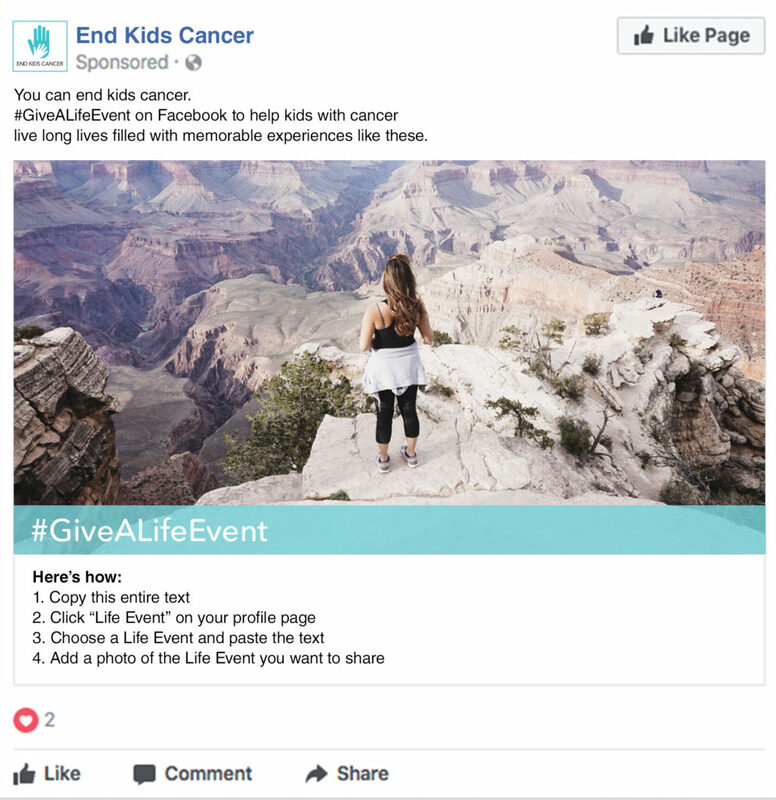 Created in collaboration with Facebook’s in-house Creative Shop, the #ShareALifeEvent campaign gave Facebook users the ability to figuratively “donate” memorable experiences and milestones from their own lives so that kids with cancer might get to enjoy lives filled with the same kinds of experiences. Beginning with a video highlighting the kinds of Life Events a participant could share, we asked Facebook users to follow a few simple steps to help us spread our message. First, they had to go to their Facebook profiles. Next they shared a Life Event or simply a photo of a real, meaningful past experience from their own lives: a marriage proposal, a first day at the beach, a first dance recital or art lesson. Any experience that they hoped a kid with cancer could live to enjoy someday, if we all invested in the fight against pediatric cancer today. Last, they pasted our standardized campaign message into the Life Event, along with the hashtag #ShareALifeEvent to spread the campaign. Facebook Life events provided more high-value real estate for our message than regular posts. But many people don’t know how to create them. So we developed a simple explanatory video and continued to reinforce why people should participate with organic content.